In this modern age in which we are living, what do you do when you start to feel not so good? If you are like most of us, you think about the symptoms that you are experiencing and then, because you understand the importance of information technology, you go online to try to figure out if what you are dealing with is serious. The internet is a big place and there are a lot of different places that you can go, but one place that most of us will visit is WebMD. Things are changing in the online medical space and WebMD is going to have to change also. How can their CIO help them do this? What Does WebMD Want To Do? Right now, there is a lot going on over at WebMD. The company has sold itself to a private equity firm called KKR & Co. for US$2.8B. Clearly the purchasers of WebMD believe that the company has a great future ahead of it. WebMD has stated that it wants to transform the company’s main website, WebMD.com, from a customer destination site for gathering information into a platform that customers will engage with and then take action to improve their health. This is exactly where the person with the CIO job can step in and help out. 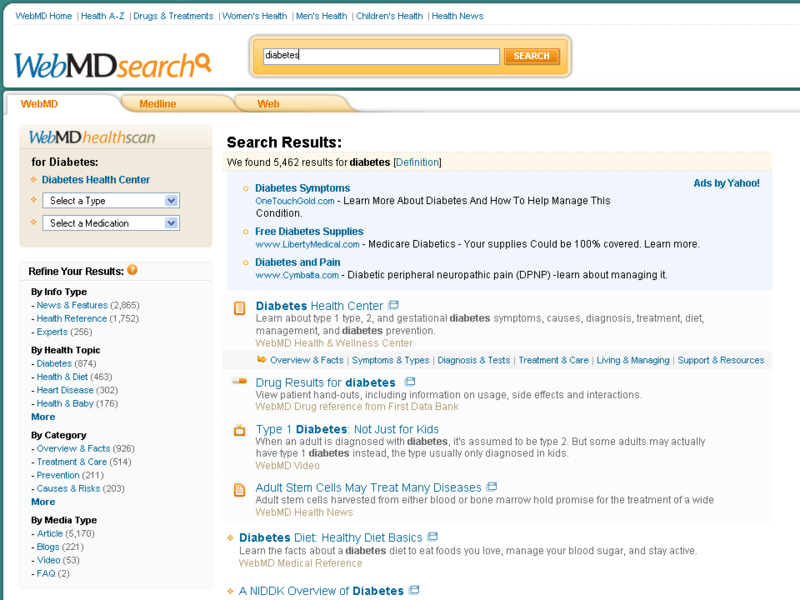 Right now, WebMD is the website that 75 million people visit each month in order to get health related information. One of the most important things for visitors is that they believe that they can obtain accurate information that they can trust. The person in the CIO job has a responsibility to ensure that the website clearly shows visitors that the WebMD editorial team is separated from the advertisers and that the advertisers won’t be allowed to influence the information that visitors are getting. When there is advertiser sponsored content on the website, the site needs to ensure that it is clearly labeled as such. It is the responsibility of the CIO to ensure that both of these tasks are always done and done well. WebMD has been in existence for over 20 years. WebMD has become a place where patients, consumers, and even caregivers come to get healthcare information. In the past, after they had gotten the information that they needed, they then went somewhere else in order to take action based on that information. The WebMD CIO is being asked to take action and transition the WebMD platform. The goal is to transform WebMD from a place where you go to get information into a place where you can now go to take action. The scale of WebMD means that they are in a good place to attempt to improve how they interact with their audience. WebMD wants their CIO to help them build on the website that they already have. What this means is that they want to be able to start to add new services that their customers are going to want. These will include extending their existing symptom checker feature. Now when a visitor uses this feature, they could be provided with options to order a lab test, book a visit with a doctor, or schedule a telemedicine visit. Likewise, if a visitor to the site read something on the site and then decided that they wanted to speak with a doctor then the site could help them to either schedule a visit to a doctor or allow them to engage in a telemedicine visit. This transformation of the services that WebMD will be offering to their visitors is expected to have a significant impact on how the company makes money. In the past, WebMD made all of its revenue from advertising and sponsorships. When the CIO makes the changes to the site that will allow new services to be offered, the sources of revenue will then change. The site will soon be able to charge their visitors for helping them to take action. Additionally, WebMD plans on letting visitors know if an action will be covered by their insurance. One of the big issues that WebMD is going to have to deal with will be doctors who believe that the website is trying to insert themselves between patients and their doctors. It is going to be the job of the CIO to ensure that the website very clearly shows that this is not the case. In fact, right now 70% of the visitors to the WebMD website who are looking for information on a disease or a condition end up making an appointment with a doctor within 30 days. WebMD wants to be seen as being a tool that will make it easier for patients to make appointments with doctors. The WedMD CIO has a real challenge on his or her hands. The company has been operating a very successful website for a long time. However, the world of online medicine is changing and WebMD understands that it is going to have to change with it. What can WebMD’s CIO do in order to keep the company successful while adding value to the website that they already have? WebMD has just been bought by a company that sees a great future for it. WebMD currently operates a very popular website that millions of people come to each month in order to get information on diseases and conditions. They very carefully try to separate their editorial content from any advertising on the site and mark ads as being ads. WebMD wants their visitor to stop coming to WebMD just to get information and then go elsewhere to take action. Going forward WebMD wants visitors to use the site to schedule a doctor visit, order a lab test, or have a telemedicine visit. The CIO is going to have to be careful to make sure that doctors don’t start to view WebMD as inserting themselves between the patient and the doctor. Instead, WebMD wants to be seen as yet another way for people to schedule a doctor visit. The WebMD CIO is lucky because the website is already very, very popular. The real challenge is that the company wants to transform the types of services that it offers and the CIO is going to have to find a way to do with without losing the customers that they already have. It sounds like it’s time to make a doctor’s call and make sure that the WebMD website can once again become healthy! Question For You: Do you think that the WebMD website will need to tell visitors that the company is making money when they schedule a doctor’s appointment? As the person with the CIO job, you have a very important question that you have to find the answer to. What is more important to your IT department: people or technology. We spend a great deal of time thinking and learning about technology because we understand the importance of information technology. Our ability to use more and more technology to further automate how our company does business seems to be increasing every day. One way to look at the future is that ultimately machines will do all of the work and the IT department really won’t need people (except for you) any more. Can this be correct?